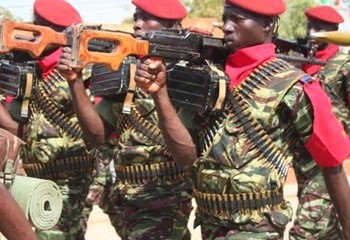 WASHINGTON DC, 13 February 2015 (IRIN) - The potential for widespread civil unrest in Burkina Faso could grow if the country’s Presidential Security Regiment continues to remain a powerful and largely unanswerable force. Civil society groups and some political parties have been calling for the dissolution of the RSP, a 1,200-strong elite force dedicated to protecting president Blaise Compaoré, who stepped down after 27 years in power last year following violent civilian uprisings. The RSP is used to wielding considerable power within the military. It briefly sized control of the country when Compaoré resigned in October, and could resort to violence if its professional or financial future is threatened, the International Crisis Group (ICG) has warned. Presidential and parliamentary elections are scheduled to take place in October, but mounting pressures from civil society and opposition groups pushing for change, the RSP fighting to maintain its status quo, and the interim government trying to strike a balance, could make for the kind of political uncertainty that could impede a successful transition to civilian rule. Tensions between the RSP and the country’s transitional government have been high since December, when the transitional prime minister, RSP veteran Lieutenant Colonel Yacouba Isaac Zida, called for the integration of the unit into the regular army and a reduction in salaries. The RSP responded on 4 February by calling for Zida to resign. A compromise was reached the following day whereby the prime minister kept his job but agreed to the RSP’s demands about who should lead the unit and who should serve as presidential chief-of-staff. The future of the RSP was kicked into touch, consigned to a commission yet to be established. In response, thousands of demonstrators once again took to the streets in Burkina Faso’s capital, Ouagadougou, and second-largest city, Bobo-Dioulasso, on 7 February, this time to protest what they saw as a compromise by the transitional government and a strengthening of the RSP’s position. The RSP are better paid, trained and treated than other members of the security services. Even though the RSP has been feared and hated in the past, anger against the unit crystallized in the wake of the attacks by security forces on protesters in the anti-Compaoré demonstrations in October 2014. According to Amnesty International’s report, hundreds of protesters were injured and several killed, when security forces fired live ammunition into the crowds and severely beat people. Several security services were implicated – police, gendarmeries, national army, and the RSP -- but the actions of the RSP dominant. Both for their past as protectors of the Compaoré regime and attacks on demonstrators, calls to remove the RSP have been a critical component of the transition. However, as the ICG writes in its most recent report, dealing with the RSP is likely to be the most difficult part of the transition. The security and political apparatus that kept the Compaoré regime in place is very much part of the transition: both the transitional prime minister and the transitional president are veteran insiders. Any alteration of the RSP’s role will have to be carefully negotiated. The speed and accommodation with which Zida responded to the RSP’s calls for his resignation underscores their influence. As much power as the RSP appears to wield, civil society is a formidable counter-force with which the government must contend. Groups such as the Balai Citoyen (Citizen Broom) and the Collectif Anti-Referendum (Anti-referendum Collective), made up of disillusioned youth opposed to Compaoré’s attempt to force a fifth presidential term, were the lead protestors in October. Balai Citoyen, along with 18 other groups, were the main organizers on the recent anti-RSP rallies. Not since the 1998 assassination of newspaper editor Norbert Zongo, has Burkinabe civil society been so assertive. Zongo had been investigating the death of David Ouedraogo, was tortured for allegedly stealing money from ex-President Compaoré’s younger brother. The case sparked protests from civic groups and the political opposition, resulting in a political crisis that eventually yielded significant electoral reforms and allowed for the opposition to increase its representation. The strength of these civil society group’s organization and unified vision, which forced Compaoré from power and led to electoral reforms, has continued to influence the character of the transition. In November, protests by civil society resulted in the resignation of the transitional minister of culture and tourism, who was considered too close to the Compaoré regime and criticized for inadequately investigating the Zongo case. Thus, even as it fears the RSP, the government should also worry about its ability to withstand organized popular pressure. Civil society has an agenda for post-Compaoré Burkina Faso, and it seems to envision a faster transformation than the government has planned. Clearly disagreeing with the government’s slow pace with the RSP, civil society organized the rallies in Ouagadougou and Bobo-Dioulasso to call for the RSP’s unconditional dissolution, an the end to having “two armies” in the country, and the integration of the RSP into the regular army. The government may find that it must negotiate with an increasingly assertive civil society, in a bid to develop a mutually agreeable and peaceful way forward. Notably, civil society is not calling for the removal of the RSP officers, but rather a re-thinking of the role of the military. For civil society, the continued existence of the RSP in its present form represents unfinished business of the transition that began in October 2014; it cannot be complete with the RSP as it current exists. As long as the transitional government appears to accommodate the RSP – a consequence of its own ties to the Compaoré regime – civil society and some political parties will continue to protest, stalling the transition.